Hands-on and online learning bring growth opportunities. Programmers, operators, and maintenance professionals can maximize results with a Siemens CNC to become indispensable on the shopfloor and in their careers. Owners can maximize ROI in all areas of investment: machines, people, and operations. CNC professionals from around the world are taking advantage of Siemens free training paths: hands-on and online. And the reason is clear. As an operator, you can gain the skills to maximize the output of your machine, increase your value to the business, and further your career. As an owner, you can skill up your staff to generate more shopfloor revenue. The means to control your future is in your hands. Hands-on training will help you learn, understand, and apply the skills you’ve mastered to move your career forward. Through a team of knowledgeable Siemens instructors, you can gain first-hand experience working on the types of machines you will encounter in your own shop. 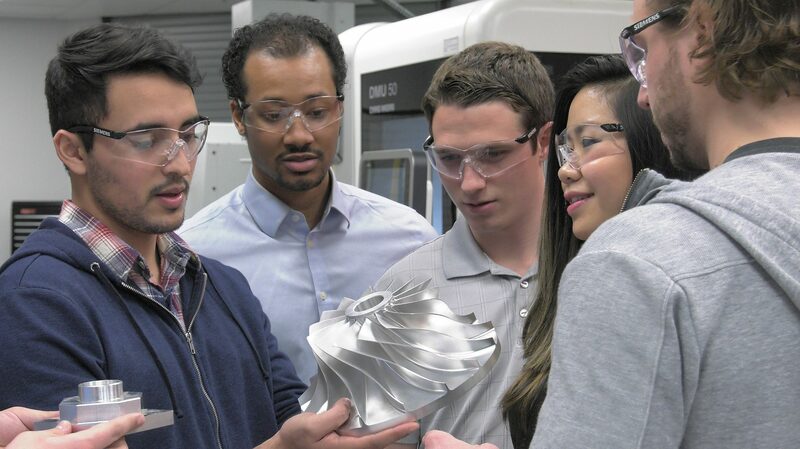 A comprehensive schedule guides you on the journey from introductory classes through advanced 5-axis programming. In addition, service and maintenance classes are available to teach personnel how to perform PLC and drive diagnostics, check the topology of the system, commission, and troubleshoot the system. Getting to a Siemens training center may not always be possible for you. But you still have plenty of options. Live, online courses are presented monthly, which include insightful question and answer sessions. Courses are archived and available on-demand, so you can access them anywhere, anytime. Our ever-growing CNC online learning resources are updated with new and fresh courses often. Plus, for larger groups, custom online training sessions are available. 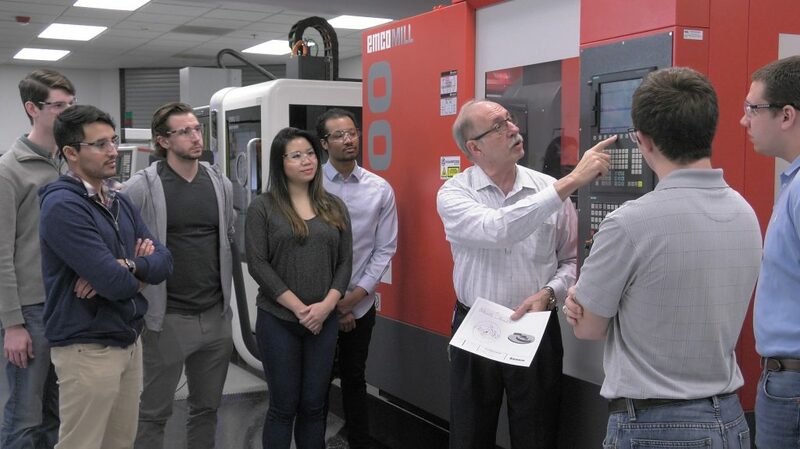 The curriculum not only provides you with hands-on experience using actual Siemens CNCs, but it focuses on many of the trends that are shaping today’s machining industry. Courses are separated into four main categories: milling, turning, general operations, and maintenance/service. These categories provide everything programmers, operators, and maintenance staff need to advance their careers, and everything a shop owner needs to turn their shop into a competitive powerhouse. 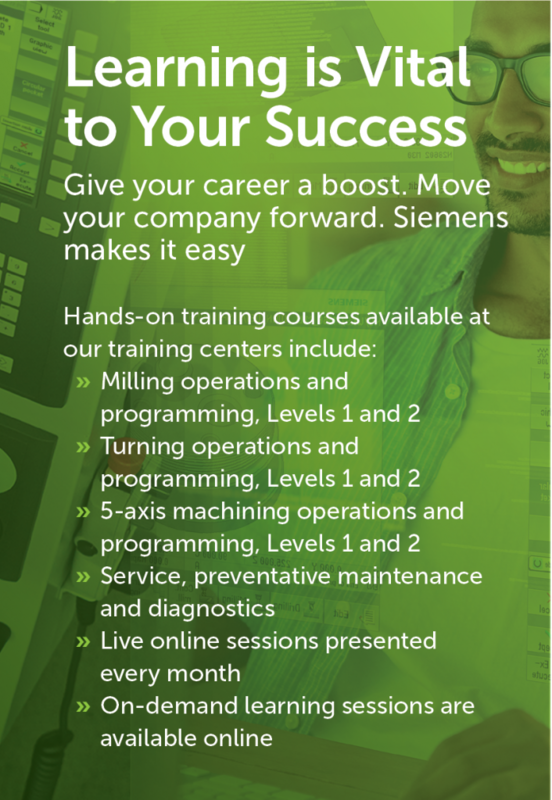 Hands-on learning sessions at a Siemens training center — such as this one in Elk Grove Village, IL — provide instructor-led experience you can apply to power up your machine tool career. Machine shops are finding that today’s digital-savvy workforce more readily interacts with controls that speak their digital language. The SINUMERIK CNC platform is based on a modern, app-like interface that is easily engaged shop-wide, from 3-axis all the way to full 5-axis machining. Machine shops are addressing fierce competitive time and cost pressures. Training staff on mixed-technology machines that do the work of two or more machines simplifies scheduling, reduces setups, and accelerates production. SINUMERIK CNC simplifies the integration of automated processes, such as robotics, that allow you to do much more, in much less time.